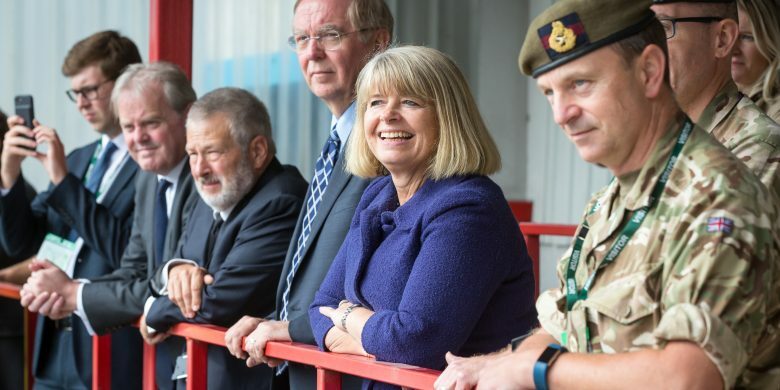 General Dynamics Land Systems–UK welcomed Harriet Baldwin MP, Minister for Defence Procurement, and Guto Bebb MP, Minister for the UK Government in Wales, on their first visit to the company’s new armoured vehicle facility in Merthyr Tydfil for an update on the AJAX programme today. The Ministers took the opportunity to meet the General Dynamics Land Systems–UK manufacturing team and toured the facility, which is continuing to undergo significant investment to prepare it for the Assembly, Integration and Test (AIT) of AJAX platforms. They also saw first-hand the initial two ARES production vehicles, which are currently undergoing Government Acceptance Testing (GAT), and discussed wider programme progress. In particular, the Ministers were updated on the five-month industry manned live firing phase of the AJAX programme, which started in early September and will test the performance of CTA International 40mm (CT40) cannon, Chain Gun and Smoke Grenade Launchers onboard the AJAX variant. The Ministers were also updated on the broad spectrum of AJAX programme trials, across the different prototype platforms, undertaken by General Dynamics Land Systems–UK in recent months. These trials include altitude-climatic, air deployability, littoral fording and driver training. During their tour, Minister Baldwin and Bebb were given a demonstration of the capabilities of the ARES platforms by an on-site team from Army Headquarters, who are conducting the GAT on behalf of the British Army and the Defence Equipment & Support (DE&S) organisation.